I'm not much of a bar hopper, but when I do drink, I look for a place where food is as good as the wine choices. Also important are comfortable chairs, good lounge music, laid-back vibe and most importantly, not having to fight with 20 other people decked out in black elbowing their way to a drink at the bar (Edison, anyone?). I should also say I don't like the bars much in LA compared to ones in NY, only because they seem to lack a certain edge, quaintness as well as indescribable coolness factor. I'm not talking velvet rope. I detest that. But I think I found at least one wine bar I like in Pasadena, Vertical Wine Bistro. Sure, it's overpriced ($15 for unremarkable braised garlic chicken!). You pay for the ambiance and decent food. The star of the night was hands-down the fried calamari with apple aioli and lemon. I don't think I've had calamari in LA that's crispier and fluffier on the outside. It was also just chewy enough on the inside without being gummy. Because the batter was so ethereal, it almost felt like guilt-free fried food. I could hardly taste the apple in the aioli but the garlic in the mayo dip was good enough for me. Another nice feature is the bar's 17 wine and champagne samplers. They are called "flights" and range from 3 Sauvignon Blanc sampler for $16 to 3 Northern Italy sampler for $26. There is an extensive by-the-glass wine list and other cocktails or drinks available. The sparkling wine sampler was fun. I'd like to try the fortified wine sampler sometime as I love port, although not so much with savory food. The delicious arugula and pear salad with goat cheese (the hard kind) and toasted hazelnuts tempered the heavier fried calamari very well. It was simultaneously crunchy and refreshing. Less impressive were the grilled cheese sandwiches, which came in all-too-sweet raisin walnut toast bread that took away from any hint of the gooey cheese. Big distraction. The braised garlic chicken was nothing special. The grilled wild salmon with lentils and bacon was a tad fishy, but the flavorful lentils were cooked just right, as was the bacon. Then again, anything tastes better with bacon. As the name suggests, the entrance takes you up to the second floor where a cozy lounge area, bar and separate restaurant side await. The service is even and crowd very casual. Let's just say you won't run into young hollywood in this joint. One thing management could train staff better on is to avoid pressuring patrons by asking multiple times whether staff could clear the table when we weren't finished with the dishes. I felt unnecessarily rushed. I had the distinct privilege of having a superb home-cooked Afghan meal thanks to the remarkable hospitality and generosity of our friend and his mother, Mrs. O. I hope this post will do her amazing cooking justice. In one day, she managed to make five things -- all of which were delicious. My personal favorite was Bohlahni, flat bread stuffed with potatoes and green onions and baked to perfection. It was so versatile that we ended up having it for breakfast, lunch and dinner, as well as an in-between snack. 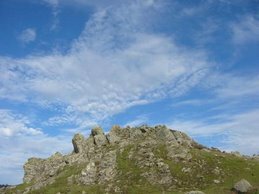 The skin is soft like crepe but also rises and toasts to a slight crunchiness. If you like spicy, sprinkle some fine red pepper flakes. The combination of the soft potatoes, green onions and the spices is heavenly. 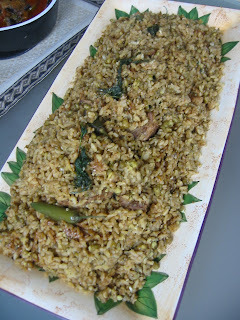 The massive rice dish (above) is Shoala, also called heavy rice. 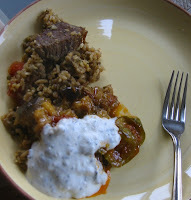 It has chunks of beef, lentils and many other aromatic herbs and spices that complement each other very nicely. I tasted some parsley and something like cumin but can't place all of the ingredients. This rice dish pairs well with an eggplant dish called Bourani Bauhnjahn, which is like a casserole of eggplant, tomatoes and aromatics. 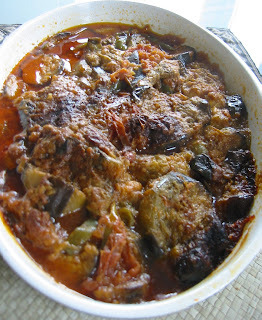 The striped eggplant slices and juice from tomatoes created a delectable sauce that was eagerly absorbed by the "heavy" rice. Top that with a home-made garlic-infused yogurt sauce that adds a refreshing touch to the rice and eggplant dishes and we're in business. 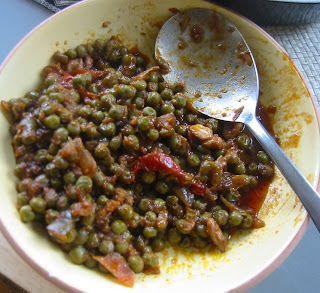 Then there was the wonderful green peas dish, Matar, which went so well with the white basmati rice cooked with a tinge of oil to fluffy perfection. The peas were at once silky, slightly crunchy and delightfully saucy. I mourn the fact that LA doesn't have a great Afghan restaurant, even compared to Tempe, AZ. I try to go to Fremont in the Bay Area -- where we liked Salang Pass Restaurant on Fremont Blvd. -- whenever we visit but it's quite a trek from San Francisco. I haven't been to Chopan Kebab House, a hole in the wall in Northridge as it was closed by the time we made it there once. Azeen's Afghani Restaurant in Pasadena was disappointing and I wouldn't go back. Stay tuned as I'll try to post at least once recipe (likely of the Bohlahni) here. I love empanadas but have been frustrated at the dearth of good ones in LA (and West Coast in general). I am partial to the baked Chilean variety (rather than deep fried), with ground beef, raisins, olives, hard-boiled egg and onions. On my recent trip to DC, I went back to my favorite empanada place in the US so far -- Julia's Empanadas. Thankfully, Julia's stays open late (4am on weekends) and we braved the cold to walk past the night revelers and stand in line with great anticipation. 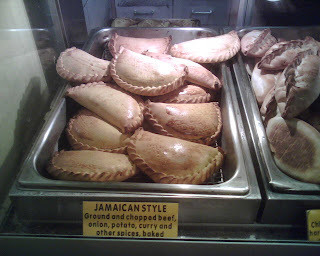 The smell of freshly baked empanadas permeated the tiny storefront as we walked in and soon we were blessed with these piping hot creations to warm our hands. We got a good sampling, including Chilean, Jamaican, chorizo, spinach, turkey and vegetarian. 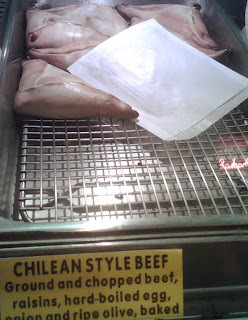 My favorite, of course, was the Chilean. Although not nearly as good as the beef ones in Santiago or seafood ones in Iquique, it sure beat all the ones I've had in the US so far. Julia is apparently Chilean, so I got lucky (Chilean shout-out: Te pasaste, Julia!). The ground beef mixture that tastes at once salty (olives) and slightly sweet (raisins) with the hearty texture of chopped hard-boiled egg that surprises you as you bite into the soft and crunchy dough. Simply the perfect (late-night) snack -- or breakfast! I am a sucker for spicy, so had to love the Jamaican one that has curry and other spices added to ground beef and potatoes. I normally don't love turkey, but I liked this empanada -- probably because it contains jalapeños. As spicy goes, the chorizo was disappointing and the mushy texture was unpleasant. I wouldn't get that again. The spinach and vegetarian ones are ok but nothing to write home about. If you want variety, get them. Otherwise, stick to the classics (or spiced up versions). I tried the sweet dessert empanadas with fruit but I wouldn't recommend them. 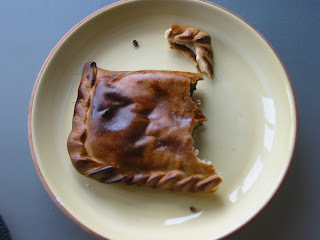 I have tried Empanada's Place, Empanada Factory and Grand Casino Panaderia & Cafe (I believe mostly Argentinean establishments) as well as empanadas sold in Rincon Chileno and Ciudad but none come close. I heard of an empanada place in Monrovia and Lake Forest that I would like to check out. If anyone else knows of a good empanada place in LA, please share.